Using Encompass Verify,run an Officer Search at Companies House. Your search returns a list of individuals with the same name. You simply select the information of interest – in this case the first report on the list – and Encompass Verify instantly presents the relevant company, director and an address. Drilling deeper, you investigate related records at Companies House such as individuals with a near match on name or date of birth and Encompass Verify presents a likely match: two entities sharing the same name but with only one having a known date of birth for you to review and confirm to merge building this unified view of the facts. Further investigation is easy. Just right click on the person of interest for follow-on search options, such as land titles or credit information. Simple and fast. 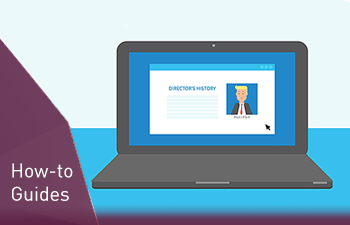 Immediately, you see that two individuals recorded at Companies House with the same name but different dates of birth and different addresses both serve as officers at the same company, one in the role as Director and the other as Company Secretary. Merging the two individuals to create a single entity, and a single view of this director’s history. He currently serves as a director on boards of 7 other companies and recently resigned from the boards of 5 other companies. In less than 5 minutes you’ve gained useful insight into this director’s history. Combined with your expertise, the full picture accelerates the client engagement and equips you to make some quick decisions about how to proceed. 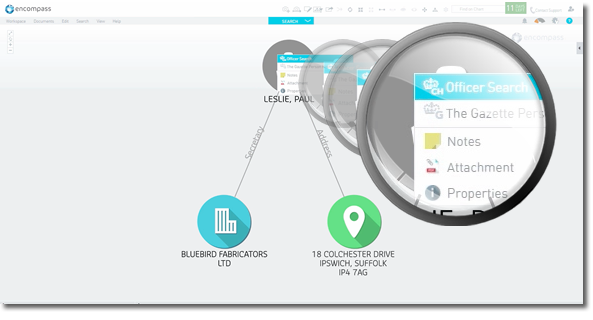 Imagine automated search in your firm: Improve speed and productivity; deliver greater client value for greater returns and standardise process to improve compliance and reduce your risk of missing important information. To experience these benefits in your firm, request a demo of Encompass Verify.